‘Stau’ is Andreas Schulze‘s new exhibition at Berlin-based Sprüth Magers gallery. Since 1983, the collaborations between the Cologne-based artist and the gallery are countless. 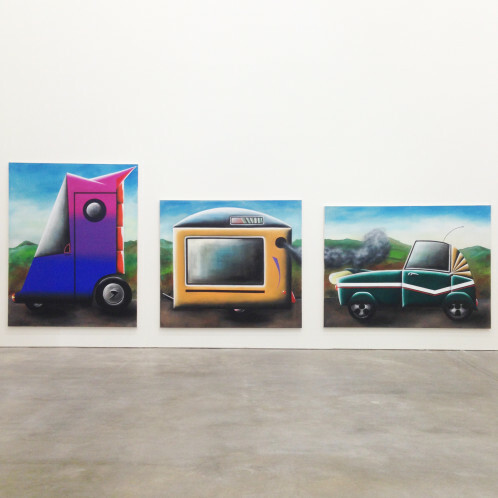 With ‘Stau’ (Traffic Jam), Schulze investigates the post-Fordian automobile design through a series of paintings and sculptures. 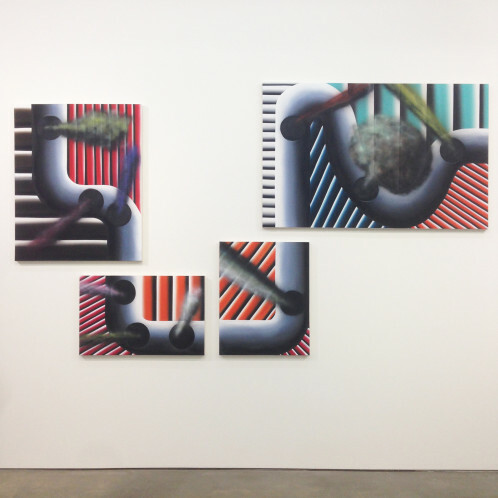 Schulze plays with the absurd: smooth surfaces are juxtaposed unlikely settings and situations. With the elaboration of trompe l’oeil, he depicts his surroundings on canvas and vases, combining a wide repertoire of forms and arrangements. 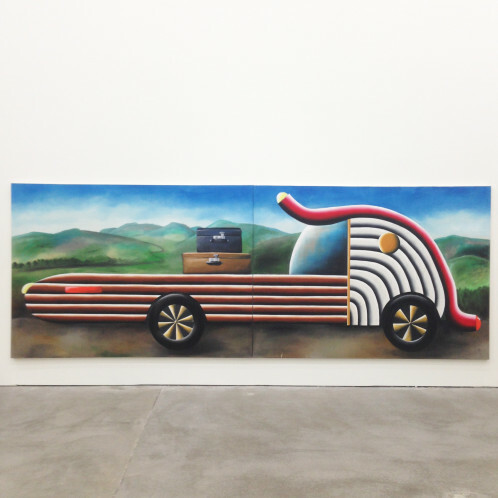 For ‘Stau’, he draws into the automobile collection in order to extract geometrical fragments that compose pieces such as ‘Untitled (Meeresdurchblick 3)’ or ‘Untitled (Sizilianischer Bauzaum mit Aussicht)’, and more figurative ones like the ‘Portofino camping’. His works play with optical effects obtained through an assemblage of forms and colours – a very unique Schulze way of composing. Along with the pragmatic vehicle theme, the flora environment provides an organic part within the works. They are represented while feinted in ‘Kräuter interessieren mich nicht so sehr’ and mystified in works such as ‘Untilted (Vase Pink)’. Joining several subjects, the German artist keeps exploring his personal surroundings ridiculing the fetish of industrial products.